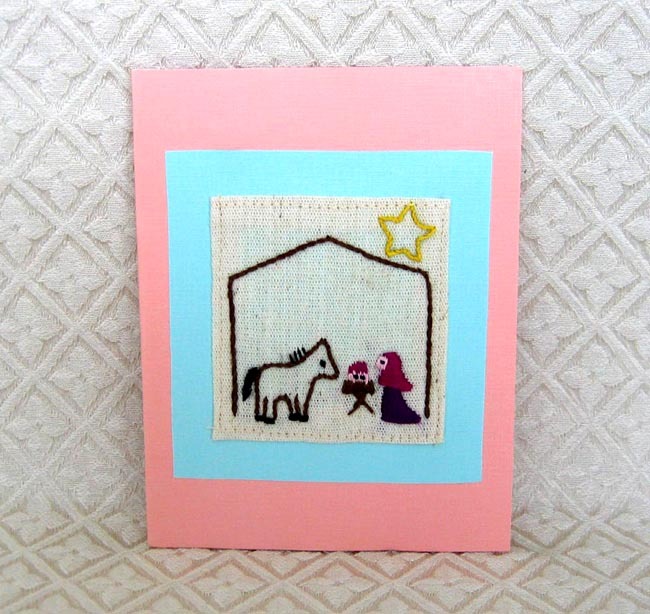 This handmade card of Mary kneeling beside baby Jesus in a stable was made by Lety, who lives in a village near Trujillo, Honduras. Lety uses embroidery floss to sew her designs onto a piece of cloth by hand. She mounts the cloth onto a piece of cardstock before affixing the completed design to the card. Each handmade card includes an envelope. The inside of the card is blank. The card measures 4.25 inches by 5.5 inches. Please note that the floss colors vary for each card, and the cardstock colors also vary. $4. Please click here for purchasing instructions.